Frame Denim merges the heritage and quality of Los Angeles manufacturing with the distinct aesthetic of Europe. The 'Le Skinny de Jeanne' crop jeans take inspiration from the French way of 'dressed-up casual' with a stretchy, flattering denim that sits mid-rise on the waist and hugs the legs in a skinny, ankle-grazing fit. 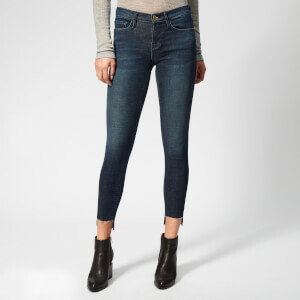 The skinny jeans' faded black hue is subtly interrupted with whiskering at the upper thigh, and slight abrasions to the front pockets create worn-in appeal. Designed with a classic zip fly, button fastening and five pockets. Belt loops and destruction to the rear pocket complete the design.